Ever since the advent of the home computer there has been a continual jockeying between the HARDWARE and SOFTWARE producers/ manufacturers/ programmers in the Industry. HARDWARE people would develop a new chip/ component, and then SOFTWARE people would develop a program that maximised the use of it. So, how do you decide which computer system to choose? Out of all those somewhat confusing options which one is right you? Well, think about the transportation example above. What do you want it to do... and where do you want it to *go* with it? Answer this question first !! This means you'll have to do some thinking about what SOFTWARE you need. Once you understand where it is that you want to "drive" in this electronic vehicle, you'll then understand what HARWARE you need to drive it with. Until you understand what your SOFTWARE needs are you'll always be at the beck and call of "Buy The Best." If you don't need it, won't use it, why pay top dollar for it, I say? As a well known technology journalist once wrote ... "The longest I've ever owned technology that was State-Of-The-Art was precisely 6 weeks." So, why pay money for a "State-Of-The-Art" system when you can buy one generation behind for 1/2 to 1/3 of the price. Ask This Critical Question First... BEFORE you go shopping. CPU is an abbreviation of central processing unit, and pronounced as separate letters. The CPU is the brains of the computer. It is sometimes referred to simply as the processor or central processor, the CPU is where most calculations take place. In terms of computing power, the CPU is the most important element of a computer system. On large machines, CPUs require one or more printed circuit boards. On personal computers and small workstations, the CPU is housed in a single chip called a microprocessor. (1) Another term for display screen. The term monitor, however, usually refers to the entire box, whereas display screen can mean just the screen. In addition, the term monitor often implies graphics capabilities. gray-scale : A gray-scale monitor is a special type of monochrome monitor capable of displaying different shades of gray. color : Color monitors can display anywhere from 16 to over 1 million different colors. Color monitors are sometimes called RGB monitors because they accept three separate signals -- red, green, and blue. After this classification, the most important aspect of a monitor is its screen size. Like televisions, screen sizes are measured in diagonal inches, the distance from one corner to the opposite corner diagonally. A typical size for small VGA monitors is 14 inches. Monitors that are 16 or more inches diagonally are often called full-page monitors. In addition to their size, monitors can be either portrait (height greater than width) or landscape (width greater than height). Larger landscape monitors can display two full pages, side by side. The screen size is sometimes misleading because there is always an area around the edge of the screen that can't be used. Therefore, monitor manufacturers must now also state the viewable area -- that is, the area of screen that is actually used. The resolution of a monitor indicates how densely packed the pixels are. In general, the more pixels (often expressed in dots per inch), the sharper the image. Most modern monitors can display 1024 by 768 pixels, the SVGA standard. Some high-end models can display 1280 by 1024, or even 1600 by 1200.
bandwidth : The range of signal frequencies the monitor can handle. This determines how much data it can process and therefore how fast it can refresh at higher resolutions. refresh rate : How many times per second the screen is refreshed (redrawn). To avoid flickering, the refresh rate should be at least 72 Hz. interlaced or noninterlaced: Interlacing is a technique that enables a monitor to have more resolution, but it reduces the monitor's reaction speed. dot pitch : The amount of space between each pixel. The smaller the dot pitch, the sharper the image. And, the hardware/ software/ hardware/ software catchup, pushing-the-envelope cycle would commence again. Sometimes HARWARE played catchup. Sometimes it was SOFTWARE. Using the analogy of transportation, HARDWARE would be the vehicle itself. SOFTWARE would be the type of vehicle, and what you could do with it. Example: An off road vehicle is very different from a stretch limo... is very different from a semi trailer. These are all vehicles, but they all can do distinctly different things. It's the same with computer HARDWARE and SOFTWARE configurations. By using the most powerful search tool on the net, Copernic. 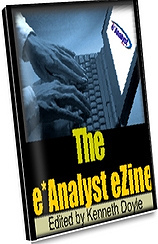 "The e*Analyst is a great learning resource! It cuts through all the marketing hype and gives you the facts!"